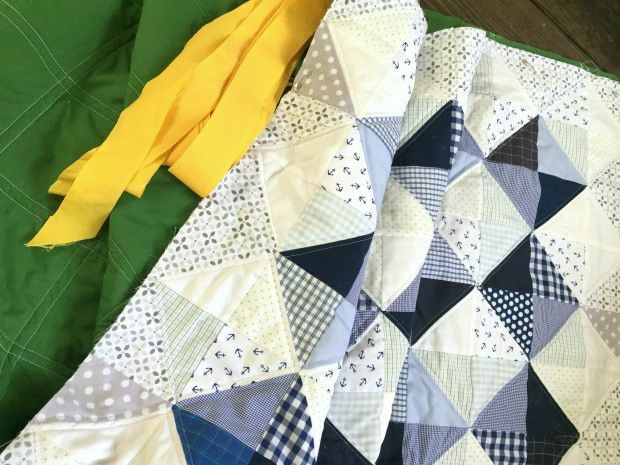 We have a new baby nephew in our family and I love to make scrap busting quilts for new little ones. 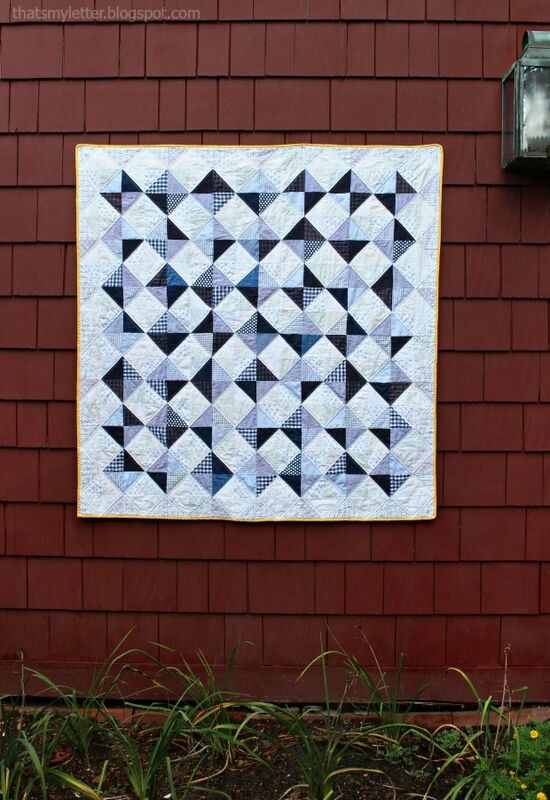 Today I’m spilling the details on this half square triangle quilt I just shipped off to him in Arizonia. It makes a great floor mat for little ones and later on a lightweight bed cover. 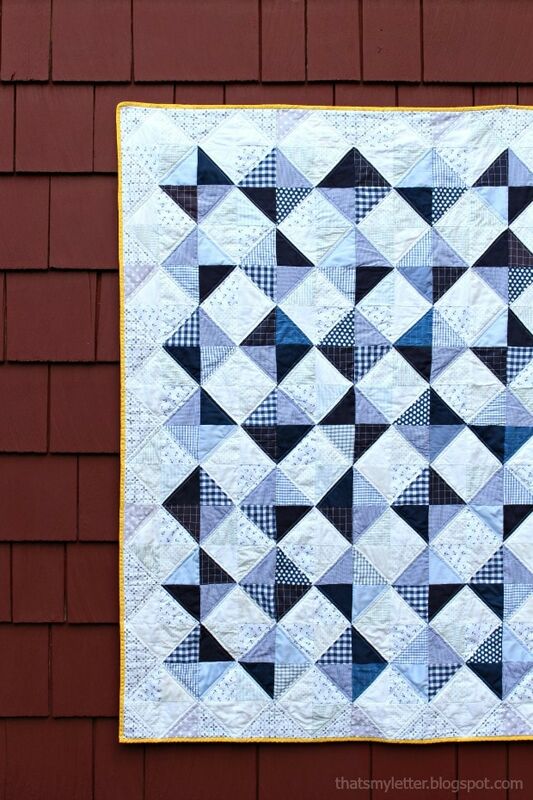 My blogger friend Michelle at Decor and the Dog made a beautiful navy and white herringbone quilt for her new son using the half square triangle method and I’ve loved it ever since she posted it. 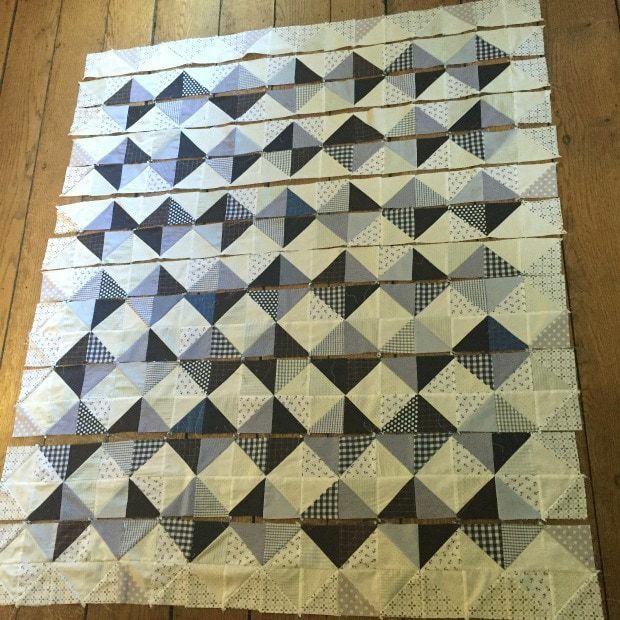 My version is more of an alternating light and dark offset square pattern. 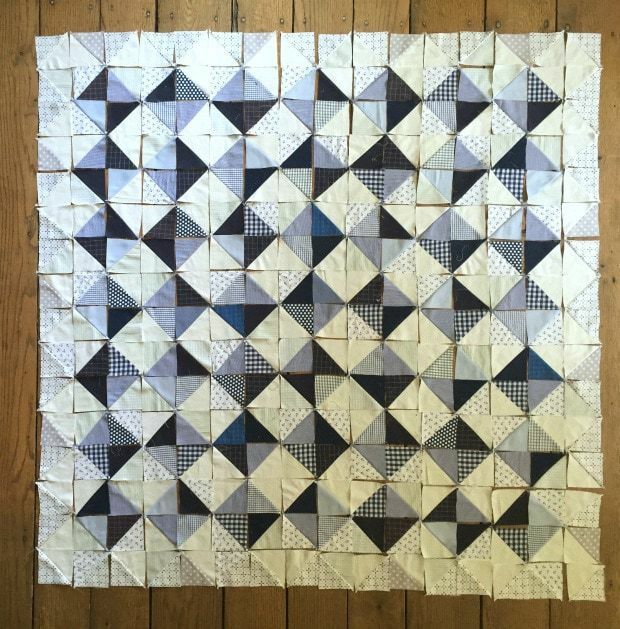 I started with 4″ square pieces, all shades of blue and white which is great for using up a ton of scraps. The backing is solid green and the binding yellow just for contrast and fun. 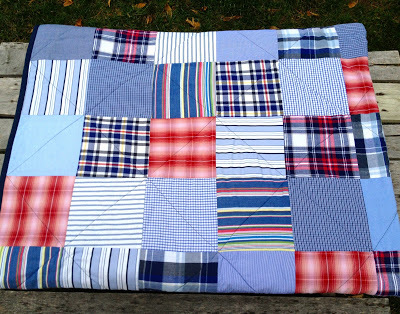 This quilt measures slightly larger than a crib size at about 64″ x 64″. 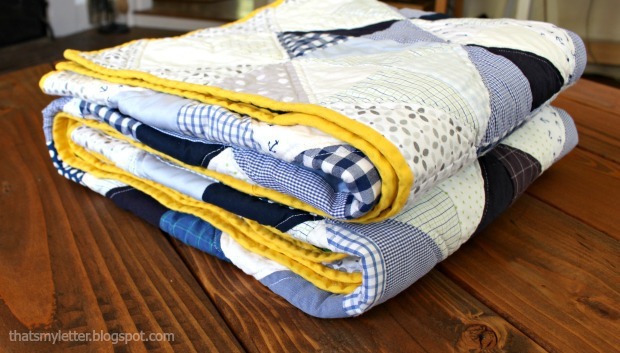 Be sure to wash and dry your quilt for that yummy puckered texture. There are a couple different methods of creating half square triangles, I followed this version for the most part. 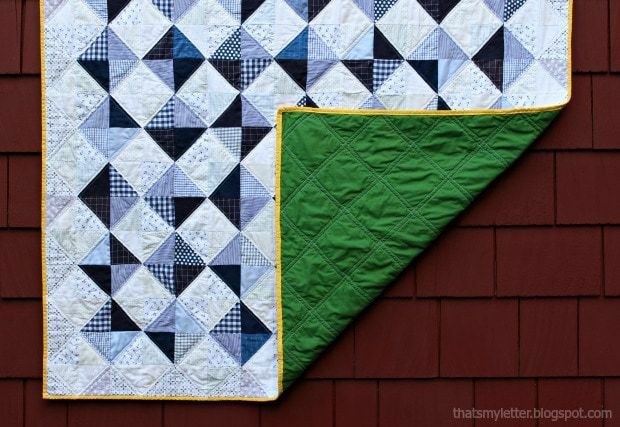 Below are the steps to create a half square triangle quilt. 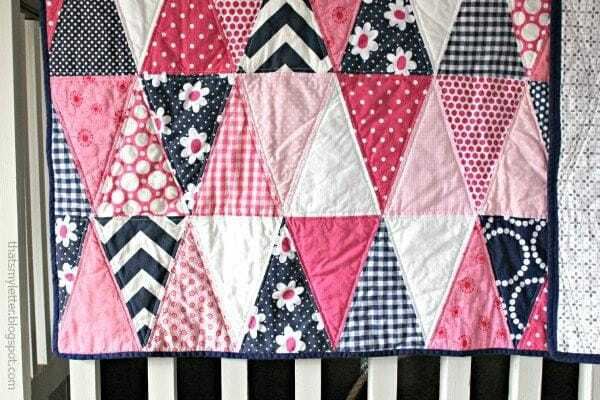 The pattern possibilities are endless so get creative and use up your scraps! 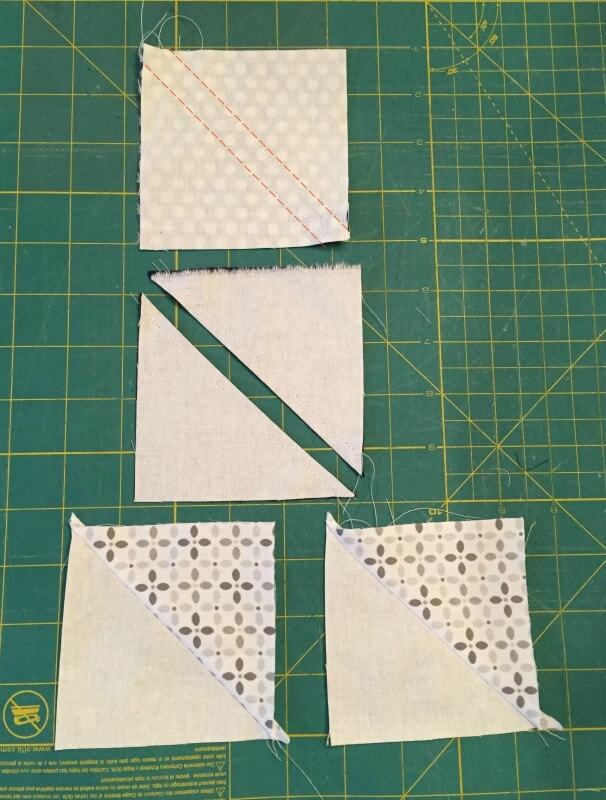 Step 1: Cut 4″ squares, mark the center diagonal on the back using a pencil. Sew one blue (or grey) to one white, right sides together, just a scant 1/4″ off the center pencil line (orange dotted lines). Cut apart. Press open the seam. Trim corners (or not if you’re lazy like me but you will have to sew through them later). Step 2: Layout all pieces in desired pattern. Step 3: Sew rows together and then rows to each other. Step 4: Make the quilt sandwich: backing, batting, top and pin together with safety pins. Quilt as desired. Make binding (mine is 1 1/4″ wide). Sew binding to front, press and fold over raw edge twice then stitch in ditch from front to complete binding. 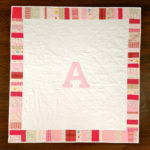 This pink and white triangle quilt went to the older sister when she was born. 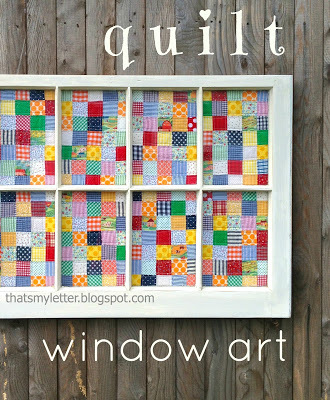 Quilts are just for the bed, I used up a ton of teeny, tiny pieces to make this window art piece. It’s so colorful and fun and hangs in my kids playroom. 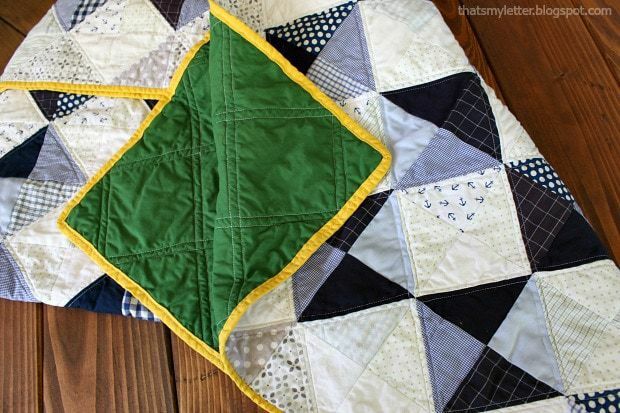 One of the easiest quilts to make is a patchwork with just squares. 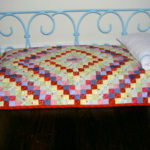 This red, white and blue patchwork quilt was for my husband’s cousin’s son. Love how all the patterns come together. 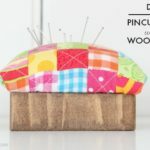 And who can resist a quilted pin cushion? 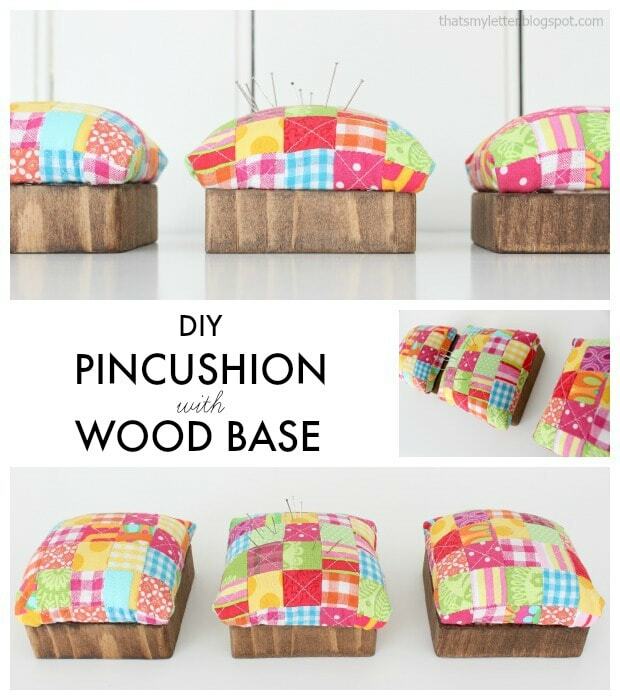 I love having the wood base to anchor this pin cushion. 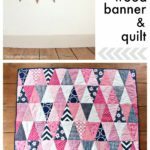 This is one of the prettiest quilts I have seen. I love the blues and whites. I can't wait to try it myself. Thank you for the instructions.